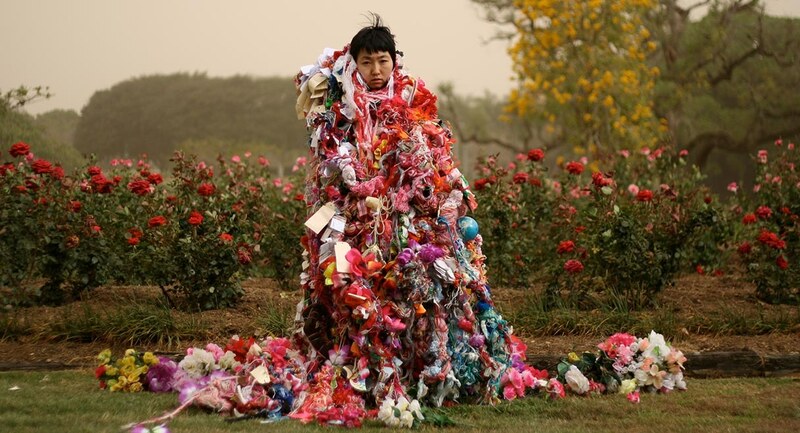 As part of The Big Anxiety associated program, Eco-Anxiety: Holding a Deep Breath considers uncertainty and Eco-Anxiety in the Anthropocene works of contemporary Japanese and Australian artists and designers. Presented at the Japan Foundation, Sydney, the exhibition features Kosuke Tsumura, Hiromi Tango, Ken and Julia Yonetani, and Yumi Umiumare. The fragility of the Australian landscape serves as both sounding board and metaphor for internalised anxiety in works by Ken and Julia Yonetani, and Hiromi Tango, channelling an empathic dialogue of breath between plants, humans, and landscape. Pockets of air sustain hope in Kosuke Tsumura’s emergency evacuees puffer jackets, which share unique inventories of identity and survival. Drawing on butoh references, performance artist Yumi Umiumare’s Eco-AnxieaTEA Pop Up Tearoom invites contemplative audience engagements exploring eco-anxiety. Presented by The Japan Foundation, Sydney. Hiromi Tango is supported by Sullivan and Strumpf. Hiromi Tango is a leading Japanese Australian artist working across performance and immersive installation environments, with a strong collaborative and community-engaged practice. Her textile based processes often draw out dialogues related to human connectedness and the empathic, healing potential of art. In 2017, Tango is presenting a major solo exhibition at Singapore Art Museum. She has exhibited internationally in group exhibitions and art festivals, as well as several solo exhibitions at regional galleries across Australia, and is represented by Sullivan and Strumpf. Kosuke Tsumura is a Japanese fashion designer exploring concepts of defence, survival, containment, and identity. Tsumura’s distinctive experimental series, FINAL HOME, blurs the territory of garment design, wearable art, and architectural functions of shelter. Designed as the final ‘home’ for an individual during times of disaster (environmental or otherwise), the garments offer practical and emotional protection for the wearer. Tsumura is the recipient of Japan’s So-En and Oribe Awards, and has exhibited internationally, including the Venice Biennale of Architecture, Shanghai Biennale, MOMA, and at Documenta13. Yumi Umiumare is an established Butoh dancer and choreographer. The Australian artist, born in Hyogo, Japan, has been creating her distinctive style of work for over 25 years renowned for provoking visceral emotions and exploring cultural identities. Umiumare’s works have been performed in numerous international festivals, and in dance, theatre, and film productions. She has worked with many socially engaged theatre projects in Australia with aboriginal communities, refugees, culturally diverse people, and a company of people with and without disability. Umiumare has choreographed a work for the Japan Contemporary Dance Network, and was the recipient of an Australian Council for the Arts fellowship (2015-16). Ken and Julia Yonetani are collaborative contemporary artists based in Japan whose practice addresses ecological issues at a global scale. Their acclaimed sculptural installations reflect the complexity and devastation of environmental deterioration with sensitive and poetic material engagements, such as salt, sugar, and uranium glass. Ken and Julia Yontani have exhibited at the Venice Biennale, Singapore Biennale, and presented a large survey show in Europe at the 12th century Abbaye de Maubuisson in France.